The red seedless table grape variety, Luca, was brought into South Africa in 2001 by Sir De Villiers Graaff. Today, almost 18 years later, Luca has grown in popularity and demand in both the local and international market. The cultivar holds promise for commercial producers due to its late maturity and seedless, crisp berries. The cultivar extends the availability of seedless table grapes into the late fall, potentially expanding the late-season market for red seedless grapes. We introduced this cultivar to growers in 2014. 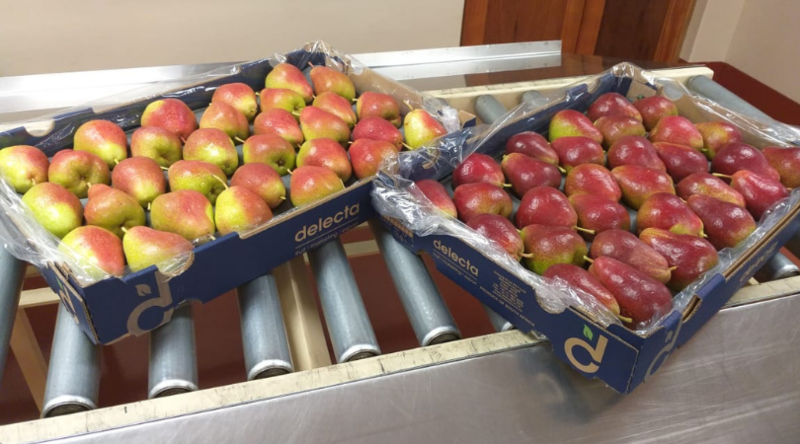 Delecta Fruit is proud to be the only exporter to currently market the Cape Fire™ bi-coloured pear internationally. This new cultivar was first discovered just over a decade ago by farmer Henri du Plessis on Elandsrivier Farm in Prince Alfred’s Hamlet. This distinctly maroon coloured pear has experienced significant international interest due to its intense colour and large size. It is also harvested at the very end of the season, two weeks after the Forelle harvest, which is another reason why supermarkets are enthusiastic – allowing them to extend their ‘pear season’ window. “We pride ourselves in offering our international buyers the latest fruit varieties available. Being the first exporter to introduce the global market to the Cape Fire™ pear is an opportunity we take seriously.” says Gert Marais, Apple & Pear Category Manager at Delecta Fruit. Like all new varieties the micro climate, soil type and rootstock plays a decisive role in the management and success of newly established Cape Fire orchards. Class 1 Forelle pears, left, compared to the intense colour of the Cape Fire™ pear on the right. Science and technology is leaving its mark on every aspect of life. Perhaps the most prominent examples are media, communication and commerce, as we see technological advancements like never before. Not so surprisingly, the agricultural sector is catching up and seeing incredible results for both growers and consumers.